It’s safe to say that things have changed for me over the past few years. Even 5 years ago I would regularly go out and have a big one on Saturday night. Often followed by a game of soccer the next morning. Sometimes it was OK, sometimes not so much! That was before I found running. Now, Saturday nights are, more often than not, quiet nights, with either a long run, a trail run or a race of some kind to prepare for the next day. Don’t get me wrong, I’ll still go out, but I will just have a few drinks, and not stay out till all hours of the morning. The time I get up on a Sunday now is the time I used to go to bed quite often after a big Saturday night. After the Masters half marathon I may or may not have had a few too many red wines and then had to back up to pace the McLaren Vale Half the next day. That worked out OK but probably is not something I should repeat! Last Saturday night I did pull an all-nighter but there was no alcohol consumed – I did drink my body weight in Coke and sports drink though. Somehow I have reached a point in my life where running around a 400m track ALL NIGHT is my idea of a good way to spend Saturday night! This weekend just gone I was at another race, but not running this time. The day after the 100km race I texted Ben, the organiser of both the 100km race and the Yumigo Summer Trail Series. I hadn’t yet entered the Saturday night trail race, deciding to wait to see how I pulled up after the 100km. On Monday I was struggling with the expected muscle soreness and also a number of blisters that made it difficult to wear shoes. So I made the logical decision and told Ben I was available to volunteer at Saturday night’s event. Not only was it a sensible idea to give myself a rest, but it was time to give back. I went for a slow 4km walk on Tuesday morning – that was the first time I’d put shoes on since the end of the 100km! I walked again on Wednesday night, this time a slightly faster 6km. By Thursday morning I was back running – a slower than normal 10km but still, running! I thought to myself, “I COULD have run this Saturday” but was happy with my decision to volunteer. I did a Mt Lofty hike on Friday and a leisurely run back down – this time wearing my trail shoes which are slightly bigger so therefore didn’t put as much pressure on my toes. That was relatively comfortable. On Saturday morning I did my first Torrens parkrun for the year and managed a very respectable 22 minutes flat. Saturday night I was volunteering at a drink station with Michelle, who had placed in the 50km run the previous week, and Tina, who I didn’t know. Michelle was originally meant to be running but hadn’t recovered as well as she’d hoped so had joined Tina and me on the aid station. It was Michelle’s idea to dress up – I told her what costumes I had and we decided to go with beer wenches. Given that we were going to be serving drinks, it seemed appropriate, and hopefully it would give the runners a bit of a laugh! To get with the ‘beer wench’ theme I brought a couple of steins and some beer and cider. Michelle had some moscato and glasses for all three of us. We were all set! 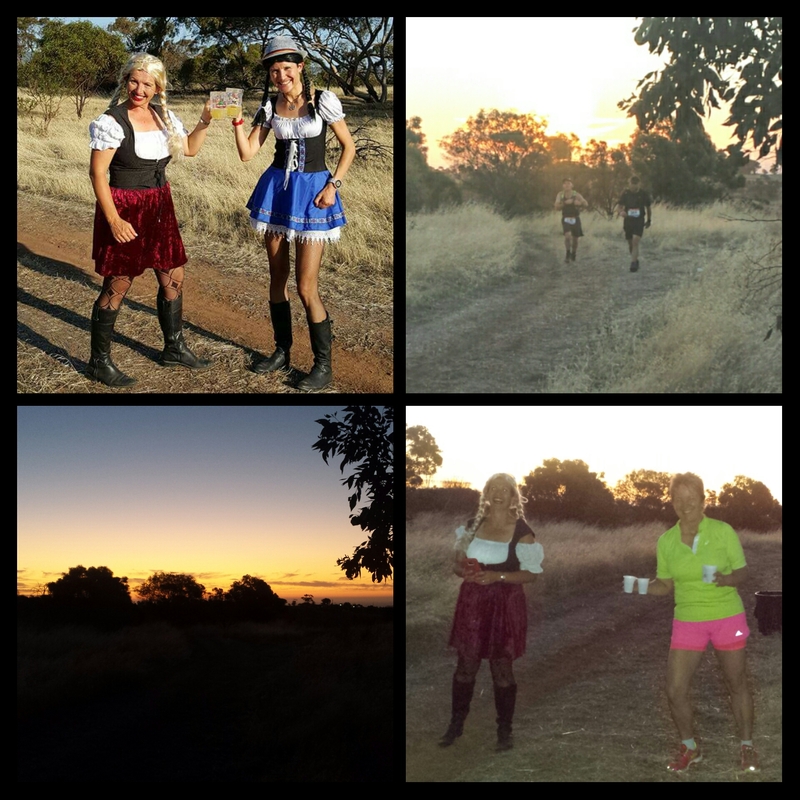 The three of us were dropped at our aid station, seemingly in the middle of nowhere but accessible by 4WD. Everything was set up, all we had to do was pour cups of water and Coke, and get out the food (bananas, chips and lollies). Luckily it wasn’t too windy, as it had been when I’d volunteered at Yurrebilla – that day we couldn’t even have all the cups of drink ready to go, as they’d blow away! It was a warm evening, so we were expecting to be busy. I’d brought my iPod and speaker, mostly to keep us entertained but also for the runners as they went past. It was just over half an hour before the runners started coming through. They seemed amused at our appearance but not enjoying the heat so much. Apparently there were a few nasty little hills in the course too. The early runners didn’t stop – they were the fast guys! Some had their own hydration vests/belts to save them from having to stop. After a while we decided to start handing out cups of water as people ran past. We got it down to a fine art – I didn’t see any cups dropped! Some people wanted cups of water poured over them and we happily obliged. I was actually surprised that more people didn’t go for the Coke on offer – although towards the end it seemed to be more in demand. There was some singing, of course. I do seem to recall singing ‘I Will Always Love You’ as one quite bewildered looking guy ran past! Like at the 100km race, I hope the singing provided some amusement and didn’t put people off! At least it might have made people run faster, to get away from us! It was quite a surreal experience, being in the middle of nowhere, cranking out some tunes, having a sneaky moscato in between the rushes of runners, and enjoying some lovely scenery (the sunset was spectacular, and I won’t lie, there was some nice eye candy on view in the race too!). Probably not many people’s idea of a fun Saturday night, but I couldn’t imagine a place I’d rather be! Although in the beginning I did have a little ‘run envy’ (runvy? ), I think I had a much better time volunteering than I would have had I run. And I’m sure my legs and feet will thank me for it! I will be out there running the next, and last, event of the Summer Trail Series, at Newland Head in March. I can’t promise there won’t be singing. You have been warned!